Buying on the eve of the Lehman crash would have left an investor underwater even three years later. But 10 years since then, the S&P 500 is up 130 percent and has posted an annual total return of 11 percent. A 60/40 stock/bond portfolio has returned 8 percent the last 10 years. It's a testament to the power of time to heal portfolios — and the virtues of adding equity exposure any time the market is down 20 percent from its high. On Sept. 29, 2010, the second anniversary of Lehman Brothers' bankruptcy, the firm put their artwork up for auction at Christies. The auction comprised the artwork that hung on the walls of Lehman Brothers' offices in Europe. Before Lehman Brothers collapsed, before AIG buckled, before the financial system fully broke down and was bailed out, stocks were already in a bear market. By Sept. 12, 2008 — the Friday before the effort to rescue Lehman came up short in a big way and unleashed a new level of panic and pain — the S&P 500 had been falling for nearly a year. It had dropped 22 percent from its October 2007 peak by mid-July. Bank stocks had hemorrhaged more than half their value over the prior year and a half, and the U.S. was nearly a year into a bruising recession. In other words, by the principles of disciplined long-term investing and contrarian logic, it might have looked like a decent buying opportunity. After all, the day before, the Dow Jones Industrial Average gained 1.5 percent led by bank stocks, reversing a 1.5 percent intraday loss. Crude oil had dropped to a six-month low. The Cboe Volatility Index surged above 25, a level that has been known to mark the approach of a trading bottom. The front page of The Wall Street Journal that Friday blared, "Lehman Races to Find a Buyer," while Washington Mutual "said it had enough liquidity and capital to ride out the banking crisis." So, what if you'd bought the market at that point, thinking stocks were already down quite a bit, and a lot of the bad news was both splashed across the headlines and reflected in their prices? If Lehman was rescued that weekend, wouldn't it plausibly spark a decisive recovery in stocks? For the next six months, buying right before the crisis crescendo would feel disastrous. A year later, it still felt premature. Even after three years, loading up on stocks in September 2008 seemed more headache than home run. But from the advantaged vantage point of today, buying on Lehman eve has been redeemed and rewarded by the passage of time, the resilience of corporate America and the durability of the bull market that's followed. The S&P 500 closed at 1,251 the Friday before the Lehman bankruptcy, down from the October 2007 high of 1,565. 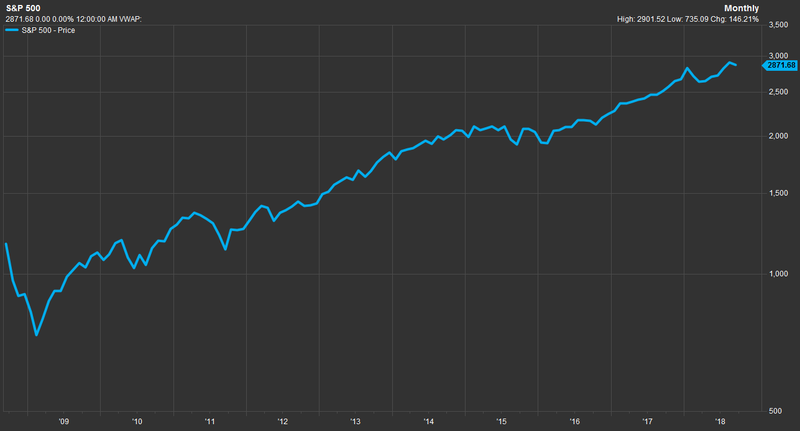 In the 10 years since then, the S&P 500 is up 130 percent, an annual average gain of 8.7 percent and yearly total return (including dividends) of 11 percent. Those numbers are right around the very long-term average annual equity performance. This is a fairly encouraging one-decade result, given that less than six months after this hypothetical purchase of stocks, the market reeled under the most violent global asset liquidation since the Great Depression. By March 2009, the S&P 500 was down another 40 percent and had gotten there in exhausting fashion: Brutal declines, interrupted by four ripping rallies of at least 8 percent that gave fleeting hope to bulls. Things got better, clearly. Through a halting economic recovery, huge government stimulus efforts, radical Federal Reserve support policies, a renaissance in corporate profits, an accelerating technology boom, three presidential elections and gradual normalization of monetary policy. Yet it's best not to underestimate how fragile and unconvincing this economic and asset-market recovery seemed along the way — and therefore how hard it often was to maintain the faith that over time the market will bail out investors' imperfect timing. The S&P 500, which bottomed at 666 on the afternoon of March 6, 2009, spent very little time under 800 — no more than five weeks in total. Yet it's climb from there back toward pre-Lehman levels was fitful and slow. Not quite a year after Lehman and five months following the market bottom, the S&P had pushed back up to 1,000, yet it was still common to view this as a "bear market rally," with the scary, doomed path of the Great Depression market on many minds. Renowned hedge fund trader Paul Tudor Jones had this to say in August 2009: "Impressive counter-trend rallies are a feature, not an oddity, of secular bear markets, we are not inclined to aggressively chase the market here. Many doubts remain about the sustainability of this recovery, most prominently the weakness of household income growth." At the three-year market, the S&P 500 had just about recovered its post-Lehman losses, but stocks had still lagged the return of bonds since the crisis and the European debt crisis threatened a global financial crisis relapse. Here's how the Los Angeles Times summed up the situation in August 2011: "RIP, bull market? Unless stocks reverse quickly, Wall Street statisticians will mark April 29 of this year as the end date of the bull market that was born in March 2009, in the depths of the last recession." By the five-year mark, things seemed on firmer footing: The S&P 500 had been making new highs for months, profits were surging, Silicon Valley humming, banks on sturdy footing. And that was exactly when the worry turned toward whether the Fed might spoil things by starting to tighten policy too soon or quickly. Through all those years of worry, the market fought its way to a respectable performance even for those who bought on the precipice of unprecedented financial calamity. How far have we come? It's no longer a moment to ask "Is all the bad news in the market and in front of our noses?" but rather, "Things are so obviously good, how has the market not captured it all?" For the record, in September 2008, the first question was exactly the right one to ask. Acting on it aggressively proved premature and humbling for a good long while, but not wrong.